Hello, sweet blog friends! 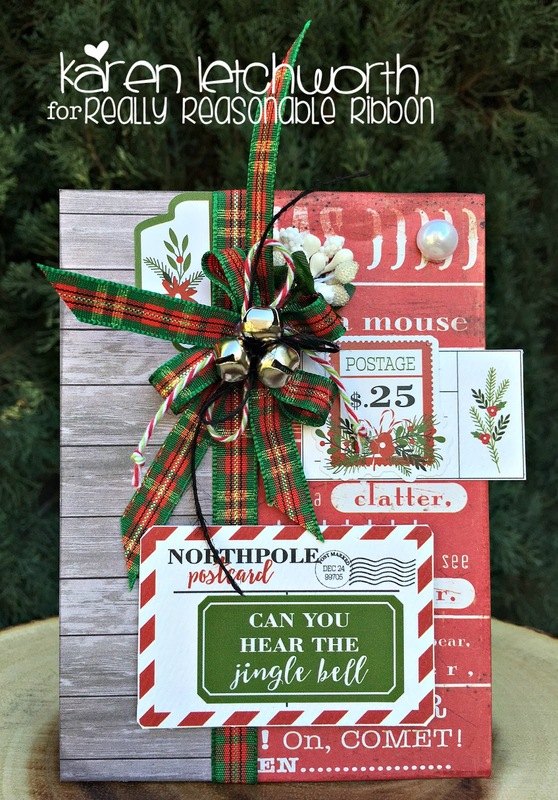 Today I'm posting for Really Reasonable Ribbon, and I wanted to share a couple of sweet Christmas cards I created using some of my favorite trims from Really Reasonable Ribbon, along with some of their new Embellishments. There are SO many sweet touches available in the Really Reasonable Ribbon Shop to help adorn your cards and projects. Check this out! Both of my cards for today were created using patterned papers, stickers and ephemera from Carta Bella's new Christmas Delivery line. This super sweet Christmas line is just filled with the sweetest designs, and Really Reasonable Ribbon helped me finish them off beautifully! On my first card (above) I ran a length of the Christmas Traditions Plaid Ribbon, and I also tied a bow with it. That's topped with a bow of Christmas Baker's Twine, and on top of that are three silver jingle bells tied with a length of Black Burlap String. I just LOVE how these ribbons, twines and embellishments work together so nicely. Behind the bow, I tucked a cluster of Wild Orchid Crafts' Bead Berry Spray in White and it gives my card the feeling of Christmas. Isn't it sweet? On my second card (above and below), I used two clusters of the Wild Orchid Crafts' Bead Berry Spray in Red. I just LOVE them. I cut some felt leaves, and added a bow made from Black Licorice Baker's Twine. You may also notice that I placed a White Flatback Pearl Sticker on each card. These sweet pearl accents come in a variety of sizes, and are such a sweet little touch as a random accent or in the center of a flower, etc. You will just LOVE all the great Embellishments carried at RRR (among all their other fabulous ribbons, trims, flowers and more). Finally, you will notice that I tied a bow of Cherry Baker's Twine to an 11mm Heart-Shaped White Flatback Imitation Pearl and attached it to my card where I had a little ink smudge. Yes, Embellishments are also a great way to cover our "little mistakes" in crafting. Again, I used the lovely Christmas Traditions Plaid Ribbon on this card by tying it in a knot and adding it to my cluster at the top right. I also tucked a small piece of the 1 1/2" Red Gingham Ribbon underneath the journalling tag. The wider ribbons, like this one, are terrific for adding a sweet touch and to give your cards a lot of great texture and personality. 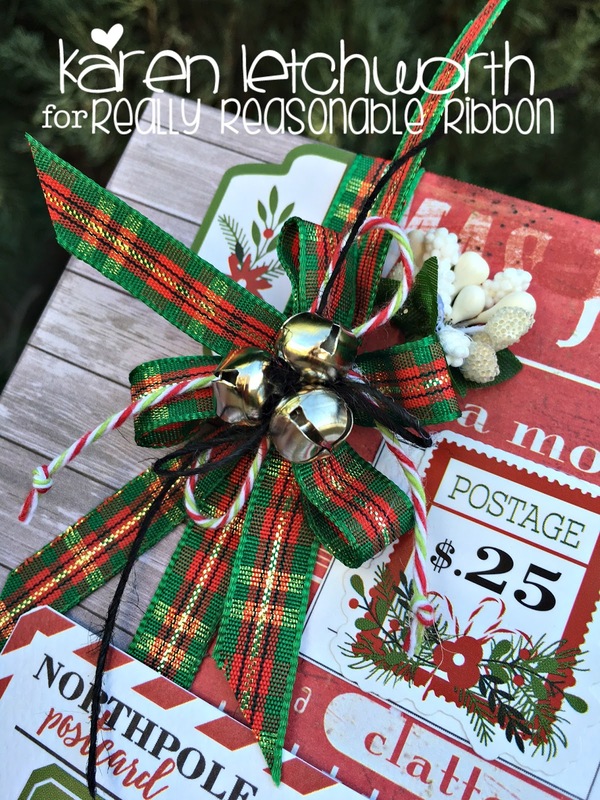 Really Reasonable Ribbon is a great place to get EVERYTHING you need to make your next card or project extra special! Thanks for stopping by, and don't forget about the fun challenge taking place now on the Really Reasonable Ribbon Blog. We love seeing your creations and having you play along with us. Lovely! Great mix of patterns and embellishments, Karen. Karen I just love both card everything is great about it you didn't miss a thing. the ribbon is my favorite I love plaid & Gingham ribbon. as for me I can not get enough of either ever. Have a wonderful Blessed week. Beautiful! Lovely layers and your sweet bows are the best! What fabulous cards Karen - I do love the dimension you have obtained with all the ribbon and berries.